AP EAMCET Results 2018 – Check AP Engineering/ Agriculture Rank Card, Cutoff Marks 2018 : Download AP EAMCET Engineering Result/ EAMCET Agriculture Rank Card, Cutoff Marks AP EAMCET Results 2018 will be published on 2nd May 2018 (Engineering & Agriculture). Jawaharlal Nehru Technological University (JNTU), Kakinada organizes the AP EAMCET exam on the behalf of APSCHE. 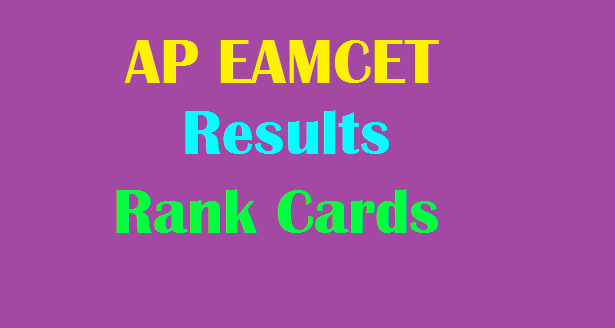 AP EAMCET 2018 Results Download For Engineering & Medical With Cutoff Marks. AP EAMCET Result will also update sche.ap.gov.in, manabadi.com, and vidyavision.com, schools9.com websites. The Official Result for Andhra Pradesh engineering, agriculture and medical common entrance test (AP EAMCET) 2018 will be release on 2nd, May 2018 at http://sche.ap.gov.in. Students qualifying the EAMCET examination can get admission into Professional Dgree courses such as B.Tech/ B.Pharm, MBBS etc. As per the schedule AP EAMCET Examination for Engineering will successfully conducted on 22nd, 23rd, 24th, 25th April 2018 and AP EAMCET Agriculture & Medical examination successfully conducted on 25th & 26th April 2018. AP EAMCET Results 2018 is releasing on 2nd May 2018. Check here latest updates about AP EAMCET Official Result releasing date, instructions. After completing the EAMCET Examination the JNTUK will announce the results . This year the JNTUK has stated that it is going to announce results on 2nd May 2018. Candidates can check the AP EAMCET result, rank card, score, and weightage from the AP EAMCET official website, sche.ap.gov.in at the same time. Fallow the below steps to download Manabadi AP EAMCET Result 2018.
a. Candidates shall be ranked in the order of merit as explained in the Annexure-IV. b. Rank obtained in AP EAMCET-2018 is valid for admission to the courses mentioned in the application form for the academic year 2018-2019 only. d. Rank obtained with the benefit of relaxation of the minimum qualifying marks at AP EAMCET-2018 by any candidate claiming as SC/ST Category will be cancelled in case the claim is found to be invalid at the time of admission to any course of study in any participating University / Institution. AMARAVATI: AP EAMCET 2018 Results were released on Tuesday afternoon 12.00 PM at Human Resource Development Minister Ganta Srinivasa Rao at Vijayawada. In EAMCET 72.28 per cent students have passed. EAMCET was conducted in 137 centers, including 6 exam centers in Hyderabad. Compared to last year, the percentage of eligible candidates has decreased. A total of 1,38,017 qualified candidates were eligible. He said the students are being sent by means of SMS short messages to the mobile numbers mentioned in the application. EAMCET results will be shown on TV screen. AP Fibernet and Real Time Governance Societies have arranged for the EAMCET students. After the results are released, a special indicator appears on the TV screen with the name of the EAMCET results. Users with fiber network connections select the index and results in the ticket number of the ticket.